I've already checked out some of the modelling sites and found this tutorial where the bloke states that the original mould is totally inaccurate and so scratch built his own one. Now he sights the Christie's auction and the DVDs as his reference source, but I can't get a clear view of it in ST:III and I've only seen two good photos from Christie's, so I have no idea what his source is. Perhaps I should get a hold of J�rg and see if he has any decent caps in that huge library of his. Oh, Pat Suwalski. Good gent. Actually, his underplatform looks spot-on. that is one dang cool model. And I do like the way he's done the underside. Makes sense to me. Agreed, but as I said from the get go, I really want to use primary sources only rather than rely on someone else's interpretation. Perhaps I'll drop him a mail and see if he still has the reference shots he based that on. 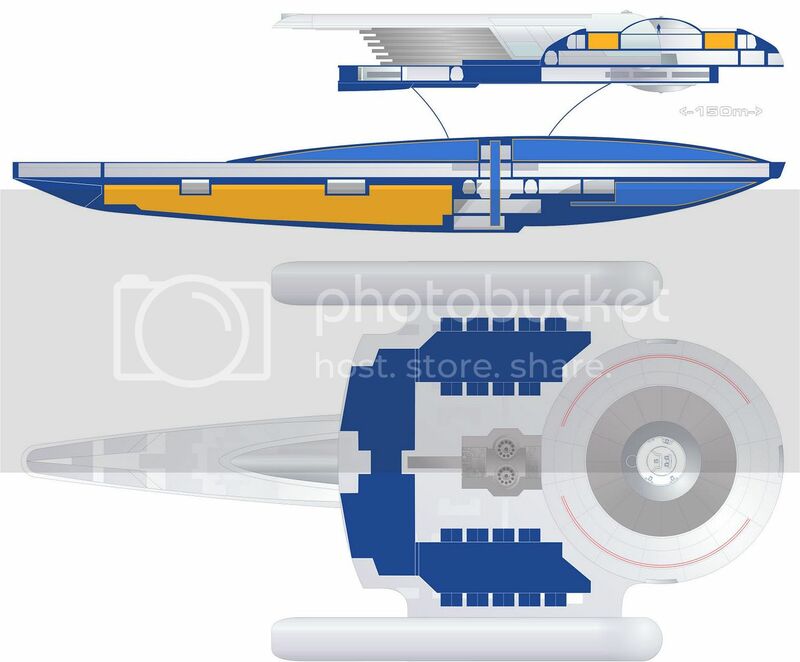 Are there going to be deck plans accompianing this schematic? We'll see. I've already roughed out a cross-section based on the 150m length, but it depends on how much energy I have left at the end. By the way, do you use blends or shaped gradients for fills are you only used circular or linear gradients. The top view of the nacelles could sure use a blended fill. This is all done on a single layer in vector, so playing around blend ranges isn't much of an option. Even if it was I never could figure out how that worked anyway. What I'll probably end up doing is add a separate object over the nacelle cap with a circular gradient and use the transparency along with the grid lines and details to hide the join. Creating blends is a vector tool, at least in Freehand. it allows you to merge two objects into a single object. it's very handy for shading sideviews of curved objects, line starship hulls. I use it all the time when circular, linear, or shaped graidents won't work. Does your program have shaped gradients, which follow the outline of a shape? Oh, you mean contour gradients. No I think freehand is about the only program that does that. I can only assume it renders the fill as a bitmap than applies it the the vector as an image tile, which would mean you have to re-render it if you make any changes to the polygon. Sounds useful though, perhaps there's a plugin that'd do it. Contour gradients (what I called shaped graidents) work just like circular or linear gradients. You can change the shape or the colors or whatever just as with other gradients. As far as I know, no bitmaps are involved. Blending is when the program draws a designated number of intermediates between two objects/shapes. Both the color and shape are dealt with. Again, it's completely a vector thing. I'm pretty sure other programs can do it too because I've seen it used by non-Freehand schematic artists. I've had a quick google and can't find any mention of it in relation to PSP, so I'm stuck with my method I think. Here's a demostration of fills and blends Freehand can do. I expect that Illustrator can do similar things. I'm still learning how to use blends correctly, but you can do shading that would otherwise require a pixel editor. Yeah I just had a quick play with the "object blend" function on Illustrator. I can really see the potential, but it's not enough to make me jump ship onto to Adobe quite yet...though if Corel continues to butcher PSP like they did with version XI then I have have to sooner or later. Still, I have plenty of experience cheating light and depth, so I'll just have to muddle along.